I often get emails, from folks all over the world, who tell me about their hopes and dreams. In those same emails, they also list off all of the reasons why their dreams just aren’t possible. When I look under the surface of their words, I can often sense patterns of shame, guilt, and self-loathing that drive most of the “reasons” they shared with me. And, the antidote to shame, guilt, and self-loathing IS self-love and self-acceptance. Always and 100% of the time. When I tell folks that self-love and self-acceptance are the answer, I often hear back some really common myths about self-love. So, today, I want to bust some of those myths. Self-love and self-acceptance are actually not the same things but they do go hand-in-hand. Self-love is the practice deliberately understanding your Truth (which includes your personality, your needs, and your emotions) and then, seeking sustainable and satisfying ways to live according to that Truth. You can’t do that if you are rejecting or demonizing who you are, how you feel, and what you need. This is where self-acceptance comes in. Self Acceptance is the ability to come into the present moment of your Truth without judging it as wrong, bad, too much, or not enough, and from that non-judgmental place, allowing yourself to be who you actually are, to feel what you actually feel, and need what you actually need. These are the most common myths I see about self-love. These myths actually drive patterns of shame, guilt, and self-loathing even deeper into the energy body and psyche, so, if you want to be able to manifest what you want, it’s important to heal these blocks. Self Love Myth # 1: Self-love is selfish. Self-love has nothing to do with being selfish. Self-love is about honoring the only relationship you will carry with you for your entire life – the one with yourself. Self-love isn’t about taking anything away from others. In fact, when you love yourself first, your capacity to love others expands. Even more than that, Contribution is a universal need which means that sharing your gifts with others is essential to your well-being. Loving others IS an act of self-love. It only becomes a problem when you sacrifice yourself to do it. Love is not a limited resource. It is everywhere; embedded into the core of everything. The more you love, the more you love. I’d also take this myth one step further and say that sometimes, honoring yourself WILL mean that some people WILL think you are selfish. And that, my friend, is something you’ll need to embrace. That is where shadow work comes in. Your ability to create what you want is directly proportionate to your willingness to let others think whatever they are going think. Nope. Especially if your definition of perfect is that everything goes your way and you never have problems or feel uncomfortable. You will still experience frustration. You will still experience shame. You will still experience fear. Life is full of ups, downs, and everything in between. Loving yourself won’t change that. In fact, life is a messy adventure and it’s the lens that you learn to love yourself through. You learn to love yourself, even when nothing is going your way. You learn to love yourself through the problems of life. You learn to love yourself through the discomfort. The imperfection of life is a mirror showing you where you need more love. Self Love Myth # 3: I love myself! I get massages and pedicures all the time. Self-love is not about your “surface level” self-care. 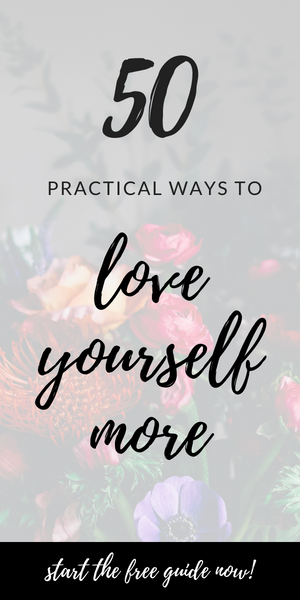 We often have this idea that doing the things that society has taught us as ways to care for ourselves (bubble baths, massages, pedicures) are the “self-loving” things to do. When in fact, things like pedicures and haircuts are often just the things that society has set as criteria for being lovable. Those things have nothing to do with YOU. Now, I’m not saying NOT to do those things if you truly enjoy them. I am not here to take those things away from you. Instead, I want to encourage you to look beyond the ways you present yourself to the external world. Self-love is a devotion to tuning into yourself in the daily moments of life – with the traffic jams and to-do lists – and taking the next best loving action. It’s about the relationship you have with yourself, even when your hair is a mess and your nails have chipped polish. Self Love Myth # 4: I can only love myself when I have achieved my goals. Self-love isn’t conditional. It’s not the end game. There is no waiting period, no perfect timing, and no ultimate goal that you must reach before you can choose love. You can choose love now. Day by day. Moment by moment. Breath by breath. In fact, the heart of your self-love practice is all about recognizing the imperfect moments and then choosing love. Because if you wait for things to be perfect, you will wait forever to love. At the end of the day, if you want to love yourself more, you’ve got to let these common myths about self-love go. There are no prerequisites. There are no conditions. There are no magic pills. Instead, self-love is about meeting yourself in each moment and attending to what is true. It’s about this present moment, right now. And now. And now. In this present moment, ask yourself what is true, right now? What do you need? How can you meet that need? What actions can you take? And, then, choosing to heal whatever stands in your way of honoring the answers. Again and again.